Not everyone can afford, or even make full use of an expensive graphics tablet. The $300 and up price tag on a professional level tablet is a major stumbling block for many. In my online teaching at http://www.ppsop.com I frequently have students asking if they should get a tablet, but tend to shy away when hearing how much they cost. So, when Wacom asked if I was interested in trying a new tablet that sells for about $200, I was eager to see how it worked. The Bamboo Fun Pen and Touch has an 8.5x5.4 active area for pen use, with a smaller 7.5x5.1 inch active area when used in touch mode. 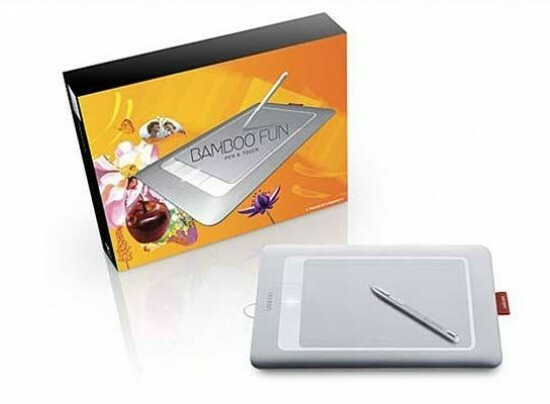 A smaller version, the Bamboo Pen & Touch (note the missing “Fun” from the name) is available for $99. This model has a 5.8x3.6 active area in pen mode and might be a better choice for traveling or those just trying to decide if a tablet is for them. 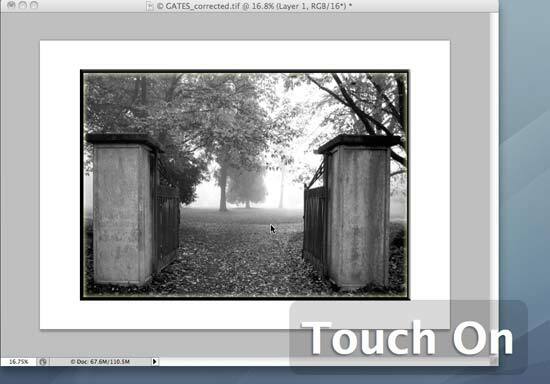 If you use a laptop, chances are you're already familiar with multi-touch. On the MacBook as an example, two fingers will scroll, and you can zoom in or out with a pinching motion. The Wacom Bamboo Fun Pen and Touch works exactly the same way, but with a much larger working area. When you're ready for precision work, the pen mode will give you the accuracy that makes using a pen so attractive for editing work. The more expensive Intuos 4 gives you 2048 levels of sensitivity while the Bamboo is half that at 1024, but in general use, this is plenty for just about anything you might need. Along the side of the tablet are four touch buttons. The tablet can be configured for left or right hand users in the control panel application, so lefties won't have to adapt to working in an uncomfortable position. Opposite of the buttons is a loop to hold the included pen. The pen is comfortable, although not quite as nice to hold as the pen found on the Intuos line (the pens are not interchangeable), and doesn't have the option to use different tips like the Intuos pen. It has the expected toggle switch on the barrel, and by flipping the pen over you can erase. As usual, Wacom has a nice software bundle, including Photoshop Elements, Corel Painter Essentials, and a selection of filters from the Nik Color Efex Pro product. There are also offers for a free Shutterfly photo album, and an online store from Café Press. 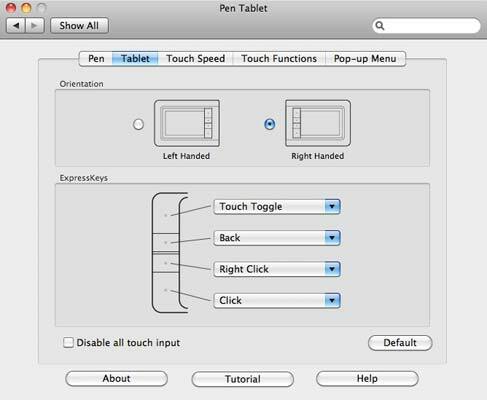 Toggling between touch and pen modes is a simple press of the top button on the tablet. You'll see onscreen confirmation of touch mode on or off. The buttons can all be customized to a number of different functions, and you can set one to a pop-up menu to run a program or enter keystrokes if you like. Touch gestures let you pinch to zoom in or out, swipe your fingers to navigate in a browser, as well as scrolling, clicking, and right clicking. And, with the rotate gesture, you can rotate on screen objects in applications that support it (like Painter or Photoshop). 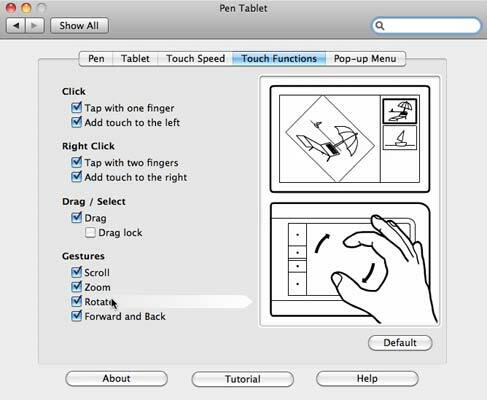 In pen mode, you can set where the tablet is active – across the full monitor or just a portion of it, and if you have multiple displays, whether to span across all screens. 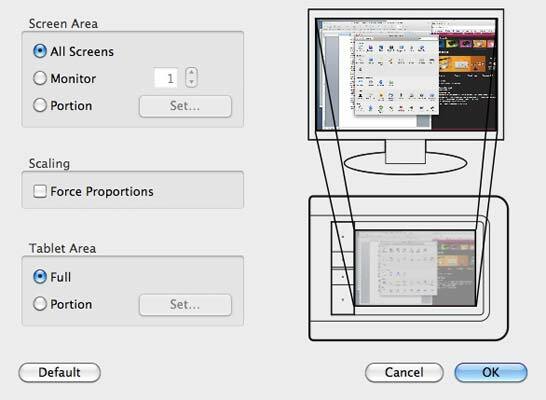 You can also configure the tablet to only use a portion of the tablet area if you prefer to work with a smaller size. I prefer to leave the tablet set to use the full area with the tablet mapping out to match the screen. 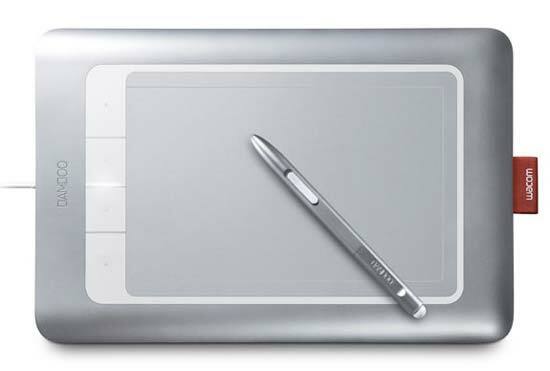 If you're just getting started with a graphics tablet, the built-in tutorial will be helpful. The Wacom Bamboo Fun Pen and Touch is compatible with Window XP SP2 or later, and Mac OS X 10.4.8 or higher and requires a powered USB port. The Bamboo line is a great introduction to pen and tablet use for those on a budget or with more casual needs. The ability to switch between a touch interface and pen use is very nice and something I wish I had on the Intuos 4 tablet. Once you've made the adjustment to editing with a pen you'll never want to go back to using a mouse – selections and masking are much more accurate and natural feeling, and the mouse will feel like a brick in comparison. For travel, I'd go with the smaller Bamboo Pen and Touch, but otherwise the Bamboo Fun is a better size for image editing. As usual, the software bundle is good, and while many will already have Photoshop or Elements, Painter is likely to be a new application and a great introduction to painting on your computer. If you're at all serious about image editing, once you've used a tablet you'll be hooked.